There’s been a lot of work getting my Rover V8 Megasquirt engine from ‘looking’ ready to actually ready to start. The headers weren’t bolted on, the battery was from a car I scrapped in the 90’s and my cheap fuel filter was leaking. I hadn’t tested my custom wiring loom and I wasn’t convinced my fuel pipes were around the right way. My Megasquirt had been bought off eBay, marked as ‘parts or not working’ as the previous owner never managed to get it running, let alone mapped. Added to that I had a custom manual flywheel, an engineering shop had grafted an automatic trigger wheel to. The crank sensor was an oily automatic GEMS item that I’d temporarily spaced with a stack of washers. When enthusiasm takes over, common sense gives way to the need to know whether it would start. I gave the wife a camera and flicked the switch. About fourth rotation of the crank with a dying battery on an engine that hasn’t been started in 7 years isn’t bad! When you factor in the Range Rover that donated the V8 had nearly 250,000 miles, that’s even better going. I ran my £3 multimeter over a few points of the circuit to make sure I had 12v everywhere I expected. The fuel pump wasn’t working which I quickly traced to the fuel pump pin of the 37 D type floating at around 3 volts. I was expecting it to be ground (0v). As a quick fix, until I debugged anything, I tacked on a ground wire to engage the relay. The engine needs a complete rebuild as its condition is unknown. It’s been sitting unloved in a damp shed for a 7 years. To get a bit of oil around, the engine was cranked over on starter with the ECU disconnected. The somewhat aged plugs were given a quick clean and the fuel pressure was checked. I have a Megasquirt JimStim which I could have used to pre-test the ECU, but to be honest I forgot. I might need it for de-bugging. The last few weeks have been a little frustrating. Even if I ignore the roof leaking directly above my Megasquirt ECU, smashing the sump on my daily driver, things haven’t gone too smooth. Just when I thought I was real close, I’d find it was Sunday night and I needed a 50 pence hose clip or something equally stupid. One job I thought was going to be quick, was the bottom water hose. The aim was to make one up out of rubber scraps then use that as a pattern to bend one up out of stainless. That ‘simple’ mock up ended up made out off 8 silicon hose bends, 6 aluminium joiners and a custom welded water pump housing. It’s currently an ugly mess with hose clamps every few inches. It had to wind its way under the front differential, over the rack, under the oil cooler, over the front prop, around the ancillary belt to the custom pump. 25 years ago, whilst working for Magnetti Marelli, I helped design the engine management for various Renaults, Harleys and Fiats. Although all that knowledge is long gone, there’s a lasting memory of small changes and big effects. Just a tiny change in sensor placement & inlet hose routing had a noticeable effect on mpg, emissions and engine mapping. Adding some under bonnet sound deadening and the resulting clearance issue, left us with a several weeks of tweaking, soldering, de-soldering and cussing just to get back close to where we started. My Rover V8’s idle rpm is somewhat high at ~ 2400rpm (according to an uncalibrated £5 rev counter) . Because of the open headers, it sounds even worse. The addition of a Bosch idle valve controller is prime suspect for messing up the idle. I think it’s fully open, bypassing the throttle flap. To test my Inlet Idle Valve theory, I will disconnect it and block up the holes. If the idle drops I’ll have a better idea of where to start. There’s no end of articles and blogs on using the Bosch controller, many give wiring diagrams but few actually show the pinout. Also the ‘IAC_close’ resistor varies from 20 to 50 Ohms depending on which site you believe. The recommended 50watt seems a little over powered. P = V2/R. 122/33 = 4.36watts. Surely if you use a 10watt aluminium resistor bolted to heat-sink, you’re well safe? Are they assuming you’ve mounted the ECU above the exhausts? Most forum sites all agree pin 2 (middle) is +12v, but the forum site I read reckoned pin 3 should connect to ground (IAC_close) and pin 1 was IAC_open. I suspect they got 1 & 3 back to front. I could simply swap the wires, but I really need to get an oscilloscope on pin 37, measure the frequency and PWM. It could be I’m not getting a signal. I’m assuming 0% PWM would be closed and 100% be open. From there I’ll knock up a little circuit with a TIP120 FET and replicate the signals. IAC open ? or close? IAC close ? or open? Other suspects include the Inlet Air Temperature sensor and Exhaust Lambda Sensor. I have no idea what the Megasquirt was set up for and I just used ones that fitted the weld on bushes I used. The Air flow through my inlet is likely to be completely different to any other setup. 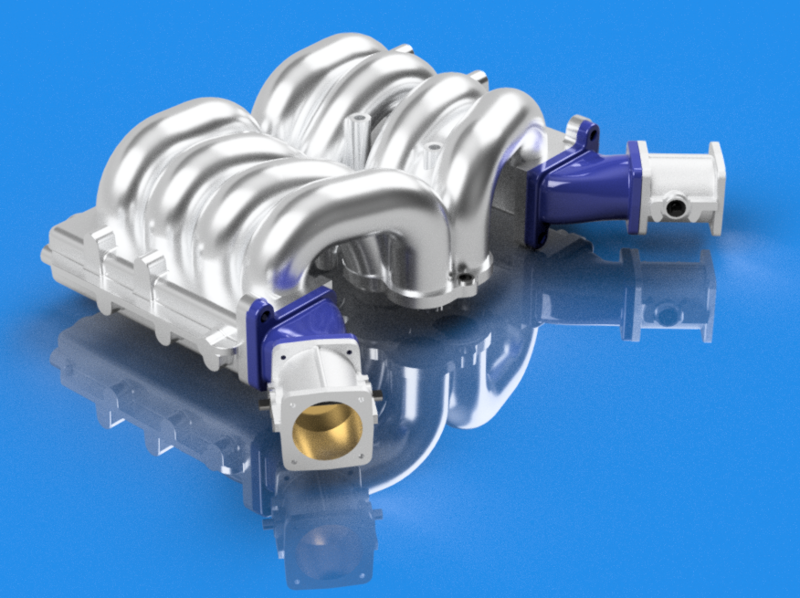 I have a 1″ plenum spacer, non-standard injectors and a fairly free flowing inlet. Both exhausts were disconnected, but it’s a custom 2.75″ free flow stainless system with 4 into 1 tubular headers, unlike any other car. I don’t even know which Rover V8 my Megasquirt was mapped for, it could have been a 3.5Litre SD1 or a full race 4.6 Thor. All I know is, it was headed for a Stag and the injector wires were missing from the supplied loom. It could even be I’d made a mistake in my loom. As the Ignition relay wasn’t engaging, then the chances are high. The chances of it idling right first time were very slim. Hopefully a bit of tweaking and re-mapping will get the idle under control. Before I try a restart, the exhausts need tweaking and the water pump finishing. Although that horrid noise was music to my ears, it definitely wasn’t a sweet engine note. I need to finish the stainless headers. There was a bit of shrinkage whilst I welded them up which means a couple bolt holes each side need a file running through them. Plus, I’ve just remembered I need to order some gaskets (Sunday night). Although the holes need stretching about 1.5mm max, hardened stainless isn’t going to be easy to file, so there’s a strong chance I’ll need to machine them. I need to wait for my pipe bender to be fixed before I can make the final hoses, but I’ll get there one day. The starter cables are a little too close to the headers but things could have gone much worse. I also need some ally to machine a proper crank sensor spacer from. Oh… I need to learn Tuner Studio a little better.